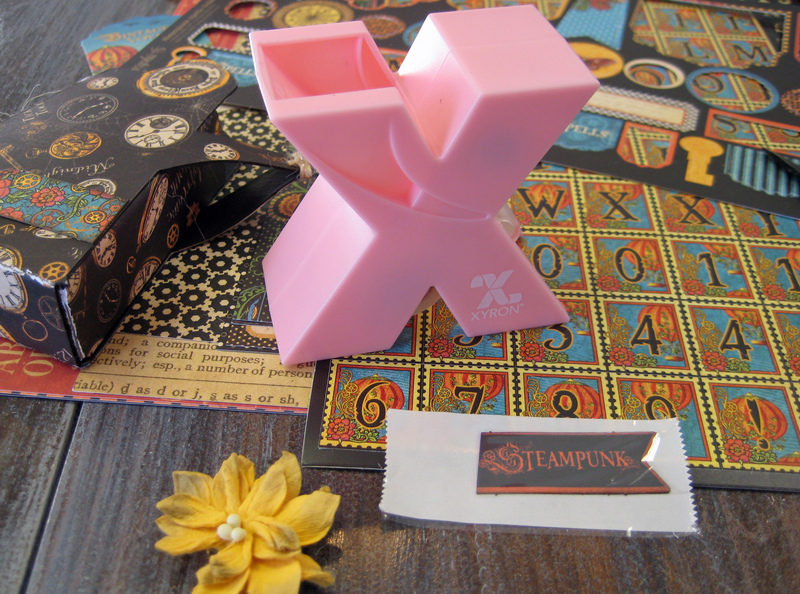 I had so much fun creating these adorable little watering can boxes for our Xyron, Graphic 45 and Petaloo blog hop. 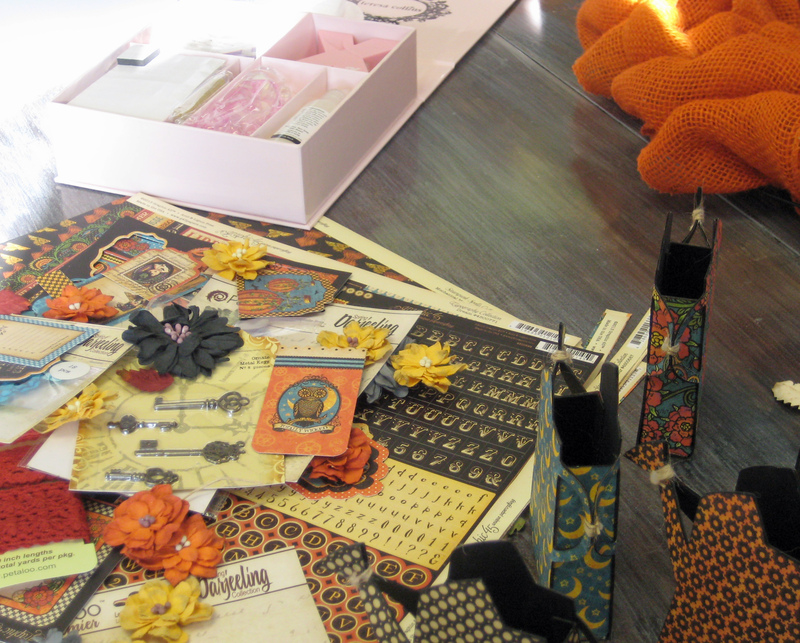 I received a ton of fantastic products to play with and just had a great time going crazy embellishing these little packages. Thanks to Xyron, Graphic 45 and Petaloo! 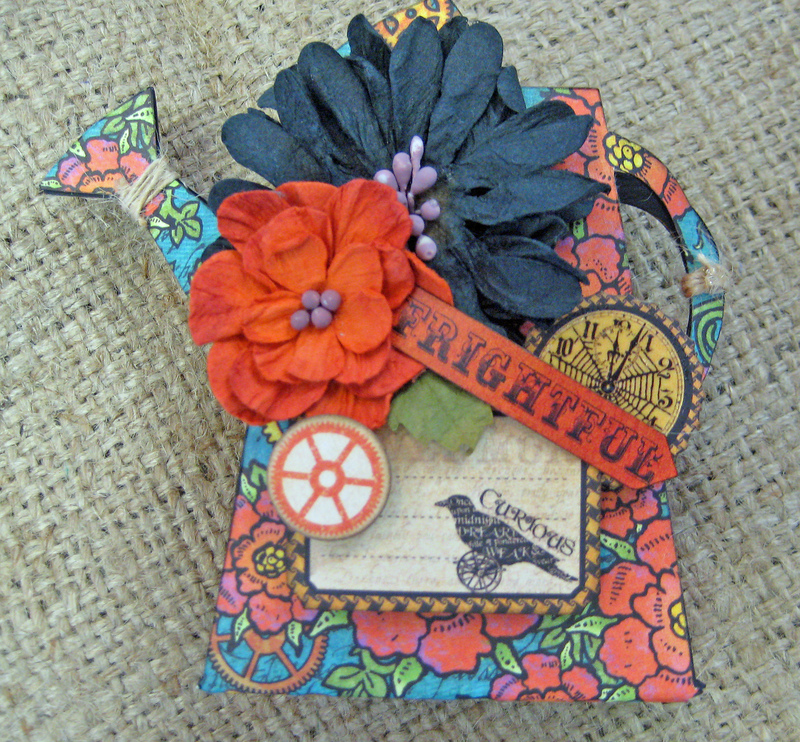 I’ve been wanting to play with Eileen Hull’s Watering Can die from Sizzix so decided to see what I could do in a Fall/Halloween theme. They would be so adorable as place holders for a table setting or fill them with treats to share at a Halloween party. 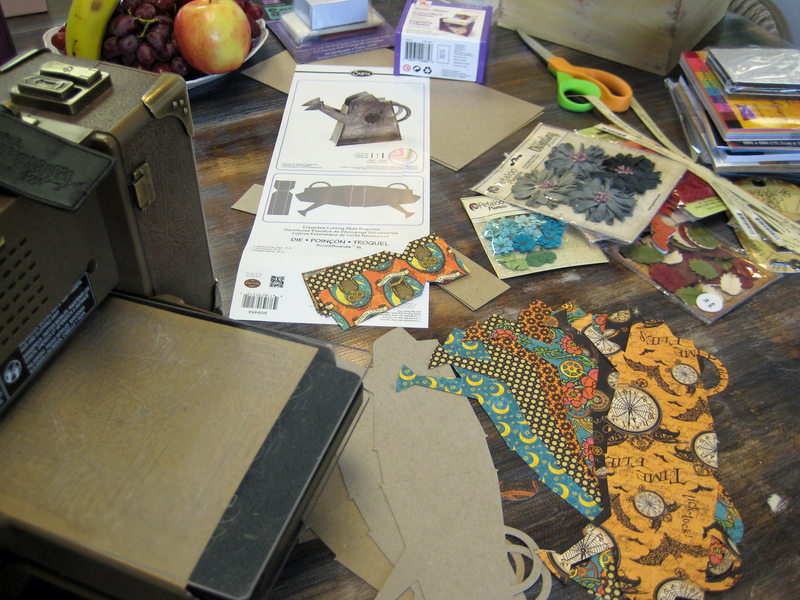 I started by cutting the shapes from chipboard and the papers from Graphic 45 Steampunk Spells Collection. I wanted the insides of the boxes and all the edges to be black to give the boxes a finished look so I painted, what would be the insides, with Ranger’s Adirondack Acrylic Paint Dabber in Pitch Black. I also painted the edges about a quarter inch all the way around so no grey chipboard would show. 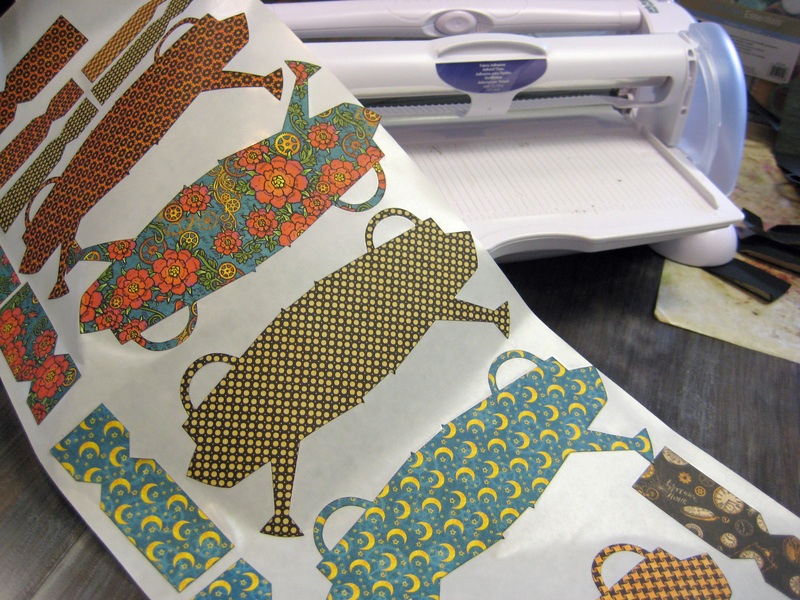 While the paint was drying I processed all the die-cut paper through my Xyron Creatopia with Permanent Adhesive. 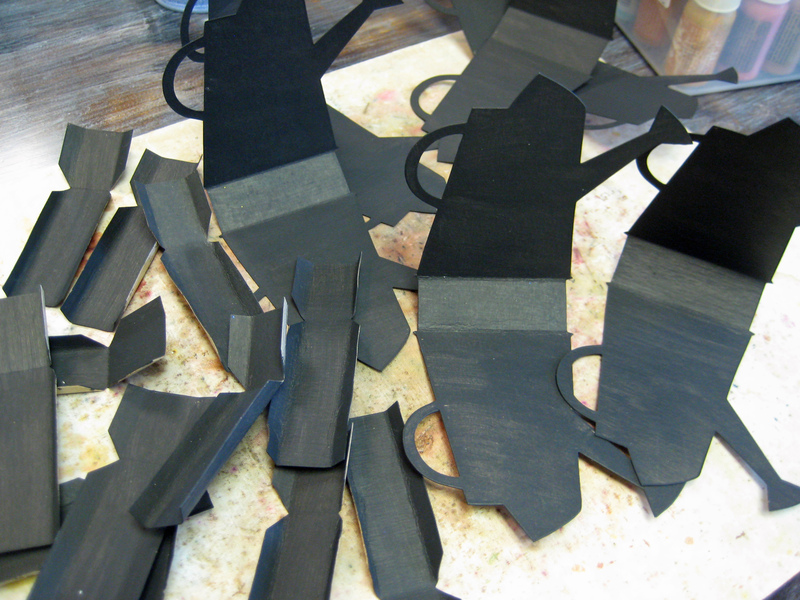 I peeled the paper shapes from the Xyron backing and laid back-to-back to the unpainted side of the chipboard shapes. I’m often asked why I use Xyron rather than a glue stick for an application like this, “isn’t it cheaper to use a glue stick?” My thoughts are that it depends on your way of thinking. It took less than 3 feet of Xyron 12″ Creatopia adhesive for these pieces; that’s about $3 worth at full price (less if you find it on sale or use a coupon). But here’s the kicker – for that $3 it saved me probably an hour or more in time and I didn’t have sticky fingers. I peeled and stuck these five boxes in less than 7 minutes (yep, I timed it). There’s no way I could peel and stick with a glue stick and keep it so neat and clean in anywhere near 7 minutes. Assembly is so easy. I used the Clear Hold Adhesive in the squeeze tube from my Teresa Collins Adhesive Kit by Xyron. 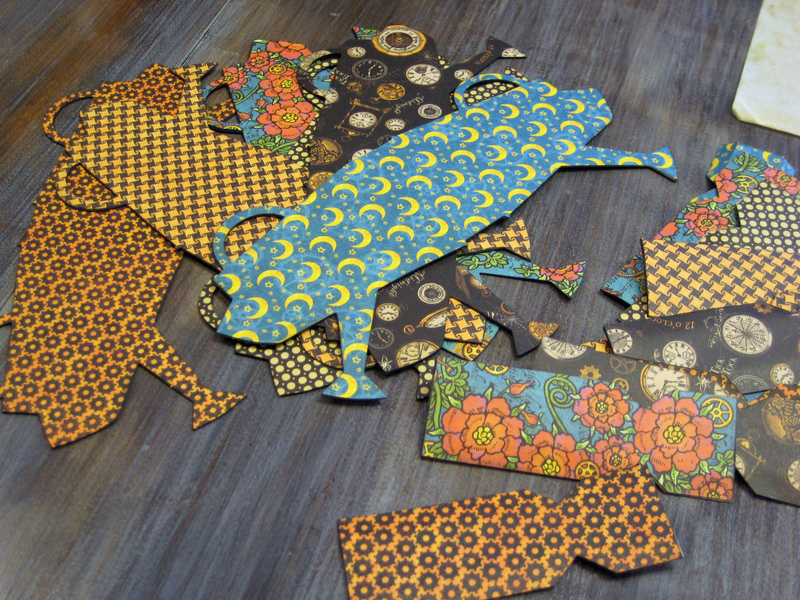 I ran a thin line of glue along the scored edges and pinched together for a few seconds until the glue set up. Then it was time for the fun stuff! 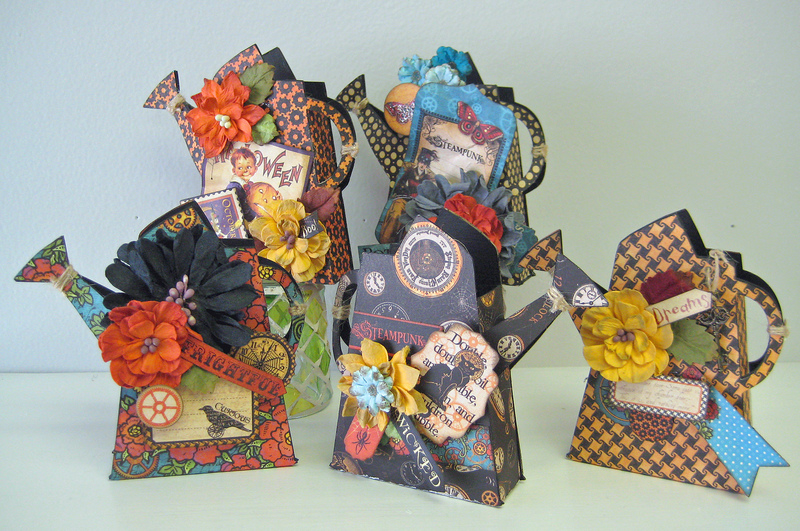 I used punched pieces from the Graphic 45 Steampunk Spells Collection and the gorgeous, colorful distressed flowers and leaves from Petaloo to embellish all the boxes. The smaller strips and paper pieces processed so easily through the 1″ Xyron Sticker Maker that was in the Teresa Collins Adhesive Kit. 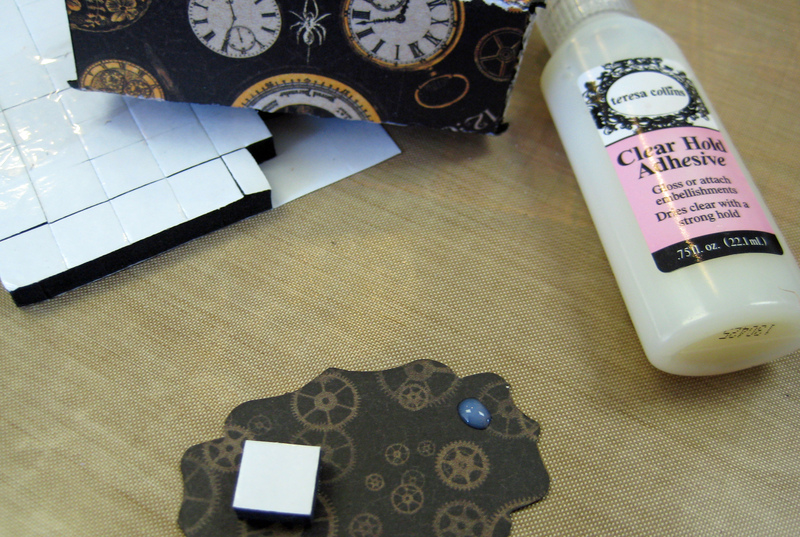 I also used the black Foam Squares from the Teresa Collins Adhesive Kit. These were perfect to pop up some of the strips and punch out pieces. The Clear Hold Adhesive worked well to tuck in bits and pieces here and there. I had so much fun I found it difficult to stop! I fell in love with that Clear Hold Adhesive. The nozzle didn’t clog and I just kept gluing and tucking! they are great, you make it look so easy. I just made a paper doll hanging and I wish I had my xyron with me. I don’t have the watering can die a new wish list item. You are right – these are so cute. I want them in many themes. that fantastiscas pitchers, the love!